This column includes activities inspired by children’s literature. In this month’s issue students investigate and construct models of food chains or food webs to help them grasp the core idea. While doing a lesson on the food chain, I found this article to be very helpful. I liked that it showed how to combine literacy with science content. The books that they showed really gave a clear depiction of what the food chain is and how to explain it to young children. I found this article to be extremely helpful and relevant for my research relating to food chains and the movement of matter in particular ecosystems. One of my favorite aspects of this resource was that it provided book recommendations for the unit as well as very clear and detailed diagrams. The diagrams were particularly helpful in understanding the different levels of the food chain! All too often I find teachers disregard utilizing children's literature as an effective means to introduce or explain difficult concepts to children. And while we may think that food chains and food webs should be a familiar concept to students, it isn't, and it's a lot more complicated than we think. This article identifies several books that discuss food webs and food chains. In addition, it provides follow up activities, questions, and assessment to do in class, all the while having the books introduce the core concepts to students. What I especially enjoyed about this article was it's ability to phrase why this matters and what the purpose behind the activities are. I think a lot of hesitation to utilizing literature comes from the idea of backward design and thinking about what we want students to know and then the most direct way of getting there, rather than looking for a more creative way of getting there. I plan to utilize most if not all of these books and lessons in my own classroom to ensure that science remains fun and interactive! This column highlights good fiction and nonfiction children’s books to help teachers combine literacy with science content. This month’s selections are about food chains and planting edible gardens. After sharing the two book selections, the author provides two different lessons, one for students in grades K – 3 and one for students in grades 4 – 6. The first lesson has students identifying what foods different animals eat and how the animals contribute to a food chain. The second lesson has students constructing a food web through a simulation game. 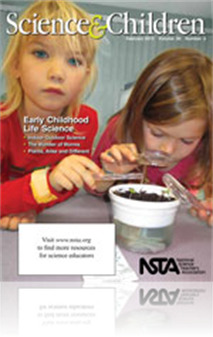 The last page of the article provides connections between the science content of these lessons and the common core standards. It also lists additional book selections and interesting Internet resources.